The chart shows the steady downgrading of earnings per share (EPS) estimates for the companies that make up the BSE Sensex. 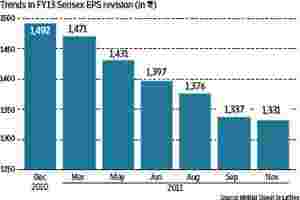 Motilal Oswal analysts have cut their FY13 EPS estimates for the Sensex by 0.5%. Taking the Sensex EPS for FY12 at ₹ 1,131, the brokerage is estimating EPS growth for the Sensex at 17.7% for FY13. That seems to be optimistic, considering that economists have started revising their targets for GDP growth downwards.